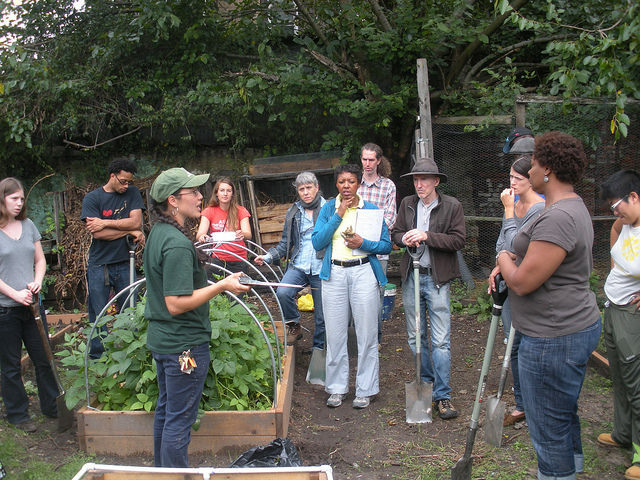 Interested In Farm School NYC? Interested in Small Farm Enterprises: Planning & Design? Below you can find out all the details about Farm School NYC's Small Farm Planning & Design course, as well as our other Fall 2015 offerings! Thanks for your interest in Farm School NYC and if you have any questions we don't cover here, you can reach out to Farm School NYC's director, Onika Abraham anytime. Dreaming of starting a community garden, urban farm or grown-food related business and just don't know where to start? Or want to take your casual hobby to the next level? Learn practical elements of community garden, school garden and urban farm design - what you need to consider and how to bring your vision to life. Then, we'll help you create a business plan, plus explore beginner marketing concepts and program planning for launching your endeavor. Learn about the theory and practice of asset-based community mapping, so you can take advantage of the assets all around you. Want to learn more? Get In Touch with Farm School NYC! Send us your email address and we'll be in touch within 3 business days. We'll send you more information about Farm School NYC, answer your questions and/or send you an application for upcoming classes! Please note: At this time, you must apply to Farm School NYC first, and then once you've been accepted you will receive a link to register for open classes. Applications are accepted on a continually rolling basis. See more photos of Farm School NYC in Action! Season Extension: Learn about the best crops for late-season production. Students will also learn about common season-extension tools: row covers, sun boxes, cold frames, greenhouses and hoop houses. We will cover the benefits and challenges of using these materials, and sources for them. Preparing for Winter: This course will cover seed saving, garlic planting and varieties, garden clean-up and tool storage, cover-cropping basics (varieties, sowing methods and planting calendar) as well as food preservation techniques.